June 2013 Walrus Monthly Mix CD – The Country Mix – FREE DOWNLOAD | DJPetey.com!!! We figured the best way to acknowledge #bouldersummer2013 was to put out a country / summer / bbq mix and give it to you all for FREE! Custom built for drinking on your front porch, hitting the lake, grilling out… whatever. 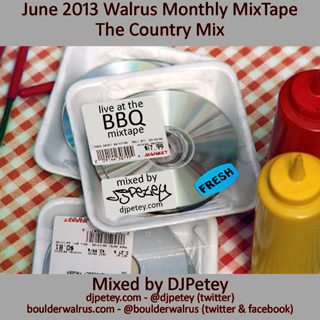 We dont do this very often, so make SURE you download this month’s mix! If you are subscribed to the podcast, you already have it in your itunes. If not, you can listen / download now by clicking HERE (left click to listen now – right click, save as to download). Or, you can click “read more” to check out the track listing now. Welcome to #bouldersummer ! Enjoy!